BMW Automatic Transmission Fluid & Filter Change – High Mileage? I’ve got 3 BMWs and have a question about timing belts. needed to be checked & replaced. Or do these cars use chains? over 200k, I’ve been advised against replacing the fluid for fear that new fluid might clean too much and cause a leak or slippage. If I should replace the fluid, what should I use? BMW or do you carry it? All of your BMW models do not have timing belts. They all use chains. There is only one engine family that uses a timing belt for the camshaft drive. This is the M20 6-cylinder. This engine was produced from the late ’70s through ’91/’92 and was used in the 320/6, 323i, 325e, 325i and 528e variants. As for your automatic transmissions, you should change the fluids …. in all of them .Yes, BMW says the fluid is “lifetime”. Yes, the original fluid will last the lifetime of the transmission, be that 60,000 miles or 120,000 miles …. or whatever. When the transmission dies, the fluid had lasted the lifetime of the transmission. Now, if we would like a LONGER lifetime of the transmission, we MUST keep fresh fluid in it. Therefore, we do want to change the fluid. The only potential problem would have been with a transmission that was not serviced properly in the first place, which then has its fluid changed at something north of 100,000 miles. There is a possibility that crud that has built up in the valve body may be softened and dislodged …. only to jam another area of the valve body. Additionally, we feel (after seeing some of these transmissions, internally) that in cases where the fluid was never serviced, the old thick fluid that is laden with wear particles, is actually helping keep the worn-out clutch packs operating by sort-of filling in the voided area between the clutch plates (the fluid in these transmissions looks like a non-synthetic oil that would have been drained from a 300,000 mile old engine, after being run in the engine for 20,000 miles …. with sand added to it). Replacing with fresh fluid just makes the transmission act as it normally would with that much wear. If the transmission were in a state of wear that would cause it to start slipping shortly after a fluid change, it would likely not have lasted much longer anyway. Of course, the wear would not be to this point if the fluid had been changed regularly in the first place! To be short and sweet ……. Yes, you should definitely change the fluid and filter at regular intervals if you wish to receive maximum service life from the transmission. Changing just the fluid is better than not changing the fluid at all. However, we would recommend changing the filters on these cars, since they do all have mileages that are higher than what we would recommend for fluid change intervals. Additionally, if the fluid is rather nasty looking, we would recommend a second fluid drain & file (no filter) after driving around the block (or the next weekend, or when you can get under the car again). This is due to the fact that you are only draining about 1/2 of the fluid when you drain the pan. 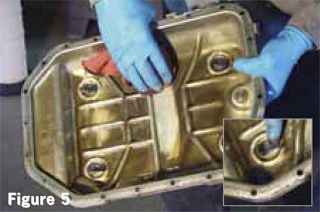 A second fluid change (after allowing all of the fluid to mix) will bring you much closer to a 100% fresh condition. If the fluid that was initially drained, looks fairly clear and there is not a lot of wear particles in the pan (or the fluid), the second drain & fill is not specifically required. Naturally, we do stock the proper fluids and filter kits. Also, check out the automatic transmission filter and fluid change DIY in the Spring 2006 issue of our Fast Times newsletter.